in a recent request for the Proteus Project, a user asked about defining test-related settings in external .config files to control connection strings settings, the location(s) of support files like the serialized dataset xml data files and the dataset xsd schema files, and possibly other things. While it might be of value to ‘formalize’ this capability by designing an actual fixed .config file format and adding direct support for it into Proteus, it occurs to me that one of the reasons for this question may be that its not entirely clear to adopters of the framework how it was intended to allow just such extension to its behavior ‘natively’. This post is intended to try to put some background context around the design concepts that went into the architecting of the unit-test-related parts of the Proteus Project codebase and in the process understand how we can simply extend the behavior of the library to read settings from any arbitrary location. Digression: Note that there are effectively two halves to the Proteus Project library: the half intended to provide convenience utility methods in support of database-dependent unit testing via the NDbUnit project and the half that provides infrastructure for domain-modeling. This post is entirely about the half related to unit testing support. The core of the database-unit-testing support provided by the Proteus project is the DatabaseUnitTestBase class. Before everyone jumps all over me for appending the ugly wart ‘Base’ suffix to a class name, this is a convention that I always use when designing abstract classes that are only ever intended to be used as a supertype from which to derive (and of course the abstract keyword helps the compiler ensure that this will be the case!). We all still use the letter ‘I’ as a prefix for interface declarations, so get over yourselves. Clearly we still agree as a community that some warts are acceptable! Its this last aspect (overridable virtual properties) that provides us the needed extensibility point for us to extend the behavior of the base class to read its settings from some arbitrary config store of our choice in answer to the issue posted to the Proteus issues list. As you can see from the above screenshot, nearly every setting is accessible via an overridable property ‘getter’ and nearly every behavior is accessible via an overridable method. 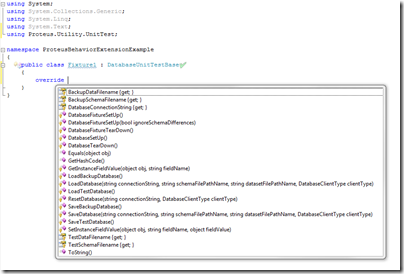 In our specific example, in our derived class we only need to override the property getters for DatabaseConnectionString, TestDataFilename, and TestSchemeFilename so that they read the values we want out of the app.config file rather than simply performing their default out-of-the-box behavior. In our case, none of these assumptions the DatabaseUnitTestBase class makes is true so we must override its behavior to reflect retrieving the settings from the app.config file based on the different conventions we want from our ‘Design Strategy’ discussed earlier in this post. To get started, we can immediately see that we’re going to need a simple convenience method in our class that can get us the name of the test fixture since its effectively the discriminator in our app.config settings. Almost an absurdly simple method, this inspects the current type (which will be the test fixture class) and returns it’s unqualified name (e.g., in the case of Fixture1, this will return the string “Fixture1”). We bother to write this simple method none-the-less because it helps abstract out how the discriminator is determined so that if at some later point we want to bother to determine it some other way, calling code doesn’t have to concern itself with how the discriminator is actually determined. A very simple example of this is that it might (later) be worthwhile changing the discriminator to be the entire fully-qualified typename (by returning this.GetType().Fullname instead) so that more than one Fixture1 class could co-exist in the same test assembly (but obviously in different namespaces else they would collide and the compiler would complain!). For our example, returning the unqualified typename is fine. Following our ‘design guidelines’ of storing the fixture-specific non-connection-string settings with keys prefixed with the fixture name, we again invoke our helper method and just concatenate it onto the front of the expected appSettings key. That’s really about all there is to it. 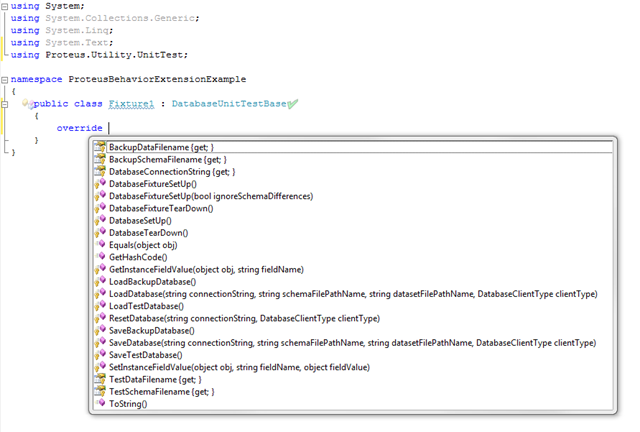 Since the methods within the DatabaseUnitTestBase class are expressed in terms of these public properties, when the class goes about its work, it will use the overridden property accessors to read the values out of the app.config rather than using its ‘default’ values for these settings. This leaves us with a bit of a conundrum however: since these base-class methods need to be overridden in each test fixture class that derives from DatabaseUnitTestBase, we would seem to need to reproduce all this code (even though its hardly much) in each of our test fixtures. I’m leaving it also abstract so that its clear (and the compiler will enforce!) that its intended to only be used as a super type from which to derive other classes. This second approach would permit you to use this new ConfigDrivenDatabaseUnitTestBase class as a base for all your fixtures without regard for whether you place settings for each in your app.config file. This specific example gives just a flavor for the kinds of extensibility that are possible using the Proteus library for data-dependent unit testing. I hope this helps clarify how its really quite simple to change the behavior of (nearly!) the entire base by deriving your own class from it and overriding properties and methods as you see the need for your specific situation(s). Since all of the methods and properties are virtual, it should be possible to twist the class into doing just about whatever you find you need. Obviously if there are things that this approach to derive-override-extend doesn’t support, let me know and I can look into extending the library in other ways too!